The Advanced Mobility Academic Research Center (AMARC) has rescheduled its annual Federal Mobile Computing Summit from January 22 to March 6 and 7 at the Ronald Reagan Building in Washington, D.C. The Summit — rescheduled due to snowy weather — constitutes the second part of the group’s Digital Government Strategy series and tasks itself with fostering discussion about the current state of mobility in the federal government. Digital Government Strategy I took place in May 2012. Individuals who’s registration remains confirmed need not complete additional registration to attend the March event. Please find the Summit agenda and registration links for additional events here. Mark Norton, a Department of Defense Senior Engineer, Robert Palmer, the Department of Homeland Security Director of Information Assurance, and Tom Suder, AMARC’s CEO and Founder will co-chair the collaborative government symposium. The day-long panels invite thought leaders to elaborate on the mobile landscape of the past 18 months expatiating on an array of topics including: bring your own device, mobile device management, mobile application store and the legal guidance and security protocols implicated in the technologies. AMARC is a non-profit organization formed to promote STEM training at academic institutions, to expand academic research capabilities within the government, and to enhance government services delivery through mobile communications technology. The summit will begin at 8 a.m. on the Friday morning of March 7, and registration will open at 7:30 a.m. To register, click here. 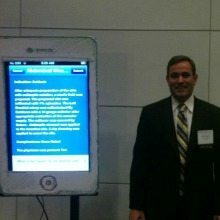 To read our past coverage of the Federal Mobile Computing Summit, Chaired by Dr. Rick Holgate, CIO and Assistant Director for Science and Technology of ATF click here. Read highlights from the Digital Government Strategy achievements here and learn about what Robert Palmer had to say at last year’s Mobile Summit onWashingtonExec.